Jonathan Spivey and Andrea Burns in “Smart Blonde.” Photo by Carol Rosegg. “There are some who think Judy Holliday was the greatest comic actress of all time, and some who think she was simply the greatest comic actress of the century.” That’s David Shipman in The Great Movie Stars (the International Years), but it could be any film historian or astute film buff. The former Judith Tuvim of Queens just had a lighter, subtler touch, and greater ability to make you laugh and move you at the same time, than anybody else; her line readings were so precise, said George Cukor, who directed five of her 11 films, she’d give you a semicolon if you asked for one. She leapt to fame on Broadway after replacing a nervous Jean Arthur out of town as Billie Dawn in Born Yesterday; won an Oscar for repeating her performance on screen (over the toughest competition in history, Bette Davis’s Margo Channing and Gloria Swanson’s Norma Desmond); and was lost to breast cancer at 43. The comedienne known for playing dumb blondes in fact had an IQ of 172, and her greatest performance may have been before the Senate, convincing the Internal Security Subcommittee she was too stupid to cultivate any Communist ties (and not naming any names). 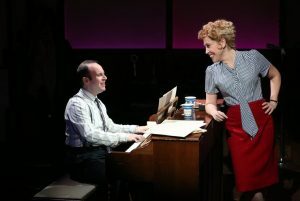 It’s a rich life, and Andrea Burns delivers a more than passable impersonation in Willy Holtzman’s Smart Blonde, at 59 E 59. A pretty smart brunette, Burns doesn’t try to literally imitate Holliday—nobody could. But she does suggest much of what was special about her, and Holtzman’s retrospective of her life manages to touch on most of her notable achievements and relationships, though we’re still left a little hungry. We start, on Tony Ferrieri’s practically nonexistent set, in 1964; it’s the first of many instances of Holtzman juggling time and facts for dramatic effect. We’re at a recording session where Holliday—not a trained vocalist, but a very effective song interpreter—is completing an LP, largely of songs she wrote with her then-beau, jazz saxophonist Gerry Mulligan. (In fact, the session was in 1960, and by 1964 she and Mulligan were largely on the outs.) “What’s the Rush,” with an arresting Mulligan melody and quite neatly turned Holliday lyrics, is a good place to start, but Holtzman might have listened more closely to its message—he seems to be in a hurry. We sprint through Judy’s early life, with an unstable mom (Andrea Bianchi), a philandering dad (Jonathan Spivey), and a passel of lefty Jewish relatives, notably Uncle Joe (Mark Lotito), who considered acting child’s play and would have preferred that his niece write for the Daily Worker. Instead, she joined a Village comic group, the Revuers, whose other members were Alvin Epstein, Betty Comden, and Adolph Green. Here we encounter a problem that Smart Blonde can’t solve: Bianchi, Spivey, and Lotito, good actors all, don’t remotely resemble Comden, Green, Leonard Bernstein, Jack Lemmon, Marilyn Monroe, Darryl Zanuck, Garson Kanin, or most of the other famous people they’re playing, though Bianchi does deliver an uncanny Ruth Gordon. Accepting them in these personages requires more disbelief than we can suspend, and their role-changing is so rapid that sometimes we’re not sure who they’re playing. Some important relationships are utterly omitted—no mention of Jule Styne, Holliday’s Bells Are Ringing composer, or her co-star in that hit musical, Sydney Chaplin, whose affair with her was unceremoniously and painfully ended when his father, Charlie, warned him to stay away from Jewish girls. But we do meet some important people in her life who won’t be familiar even to many Holliday fans: Yetta Cohn, her Communist best friend and roommate (and, Holtzman suggests, her lover, which is news to me); David Oppenheim, Judy’s well-meaning but weak classical-musician husband; Darryl Zanuck, the Twentieth Century Fox chief whose advances she spurned, if they ever actually happened. We also witness two key scenes in her career: one from Adam’s Rib, a part Kanin and Gordon wrote for her to help her win the movie of Born Yesterday over bigger names; and the gin rummy scene from the latter, which Burns plays well, if with less subtlety and subtext than Holliday had (check it out on YouTube). When you have a genius IQ, but the era you live in insists that you hide it to conform to the dumb-blonde expectations society demands of you, what do you do? Burns aptly conveys Holliday’s frustrations, and Holtzman gives her some ripe lines to express them, including a touching late monologue about how she cultivated and maintained the Billie Dawn persona to mask a more complex individual that society wouldn’t have known what to do with. I’d have liked Holtzman to have explored this more, and perhaps to have crossed out some more questionable scenes, such as a tete-a-tete between Judy and Marilyn that probably didn’t happen, and if it did, it didn’t occur in the chronology he places it in. He might also have touched more on her desire to play dramatic roles, which she surely was capable of (check out the more somber moments of The Marrying Kind), and her complicated entanglements with her extended family. But he lingers smartly on her Senate testimony, and he focuses touchingly on her long friendship with Betty and Adolph, though it must be said, these actors aren’t much like Betty and Adolph. Peter Flynn directs with his foot on the gas, and Michael McDonald’s costumes are sometimes chronologically suspect; how can they not be, with Holtzman bouncing so aggressively from decade to decade. There’s more to Judy Holliday than Smart Blonde entirely conveys, but it does convey a lot, and it’s no uncritical elegy, but refreshingly frank about its multifaceted, not always likable subject. Burns’s Judy is good company, and if you walk into Smart Blonde knowing nothing about this unique, fascinating lady, you’ll walk out wanting to know more. That’s a public service in itself. Smart Blonde is playing at 59 E 59 Theater B, 59 E. 59th St., Manhattan, through April 13, 2019. Please visit 59 E 59’s website for ticket information or call the box office at 646 892-7999.